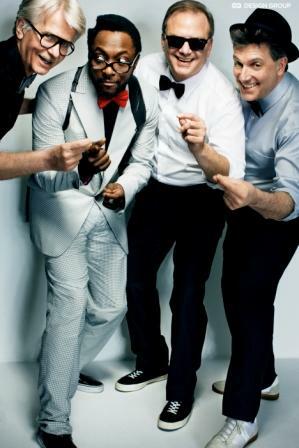 From left to right: Ron Petersen, M.D., PhD; hip hop artist Will-i-am; Steven T. DeKosky, M.D., (University of Virginia School of Medicine); Sam Gandy, M.D., PhD, (Mount Sinai Alzheimer’s Disease Research Center). Mayo Clinic and the Alzheimer's Association of Minnesota-North Dakota are presenting A Meeting of the Minds Dementia Conference 2010 on March 20, at the St. Paul RiverCentre. Dr. Ronald Peterson, neurologist and director of Mayo Clinic's Alzheimer’s Disease Research Center, will join Dr. Steven DeKosky to present the keynote, "On the Brain — The Rock Stars of Science." Drs. Petersen and DeKosky were involved in the Rock Stars of Science campaign that featured world-renowned scientists and some of America’s most celebrated musicians to spotlight the need for greater funding for medical research and to make science a more attractive career choice for tomorrow’s stars. The event will include educational information for people with early dementia, families, friends and professionals to learn about strategies for legal and financial planning, brain fitness and cutting-edge research. You can register for the event at alz.org/mnnd or by calling (952) 857-0521.